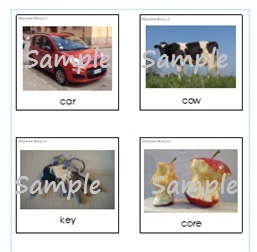 We have just published a set of 108 photo picture cards for the “c/k” sound. We chose this sound as it is probably the one that we work on most often in therapy – some children find it tricky to get the hang of these sounds which are made with the back part of your tongue! – 6 pages with ‘c/k’ at the beginning of words. This starts with simple words such as car and key and then extends through CVC words to 2,3 and 4 syllable words. – 6 pages with ‘c/k’ in the middle of words. Again there is a range of 2, 3 and 4 syllable words. – 6 pages with ‘c/k’ at the ends of words. These are divided into VC. CVC and 2 and 3 syllable words. We have also included some words with blends and the combination of ‘nk’. You can see the quality of the photos on the cover page. This image is made up of 4 of the images from the cards themselves. As you can see from the sample, each card has the word written at the bottom as well. This is a pdf download – you will receive a link to the product, which you will then need to print yourself and laminate if required. If you are a speech and language therapist, I am sure you can immediately see how you might use these. 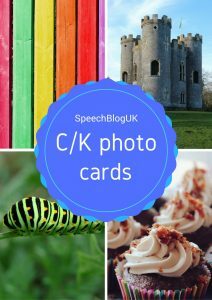 If you are a teacher, TA or parent, only buy these cards if your child is struggling with the “c/k” sound. You can find out a little about the stages of therapy here. Your child will be ready to use these cards when they are working at word level or above. It is normally recommended to start with ‘c/k’ at the beginning of words, however some children find ‘c/k’ at the ends of words easier. Some words will be easier than others. Please follow the advice of your speech and language therapist. If you want more information about speech sounds, sign up to our mailing list for a free e-book about working on speech sounds. 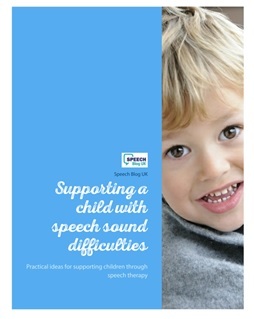 We also have two courses about helping children with speech sounds. Click here to find out more. For ideas of games to play with these cards to keep therapy fun and interesting, check out this post and this post where we have listed lots of ideas of games to play to practise speech sounds. You can buy this pack of picture cards for £4. Click here to buy or click on either of the images above. 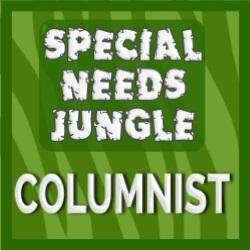 How to use nerf guns in speech therapy! Do you have something similar for working on f/th please? I often find the dyslexic children I work with have a difficulty there. And specific guidance on how to teach them to discriminate between the two would be very helpful?